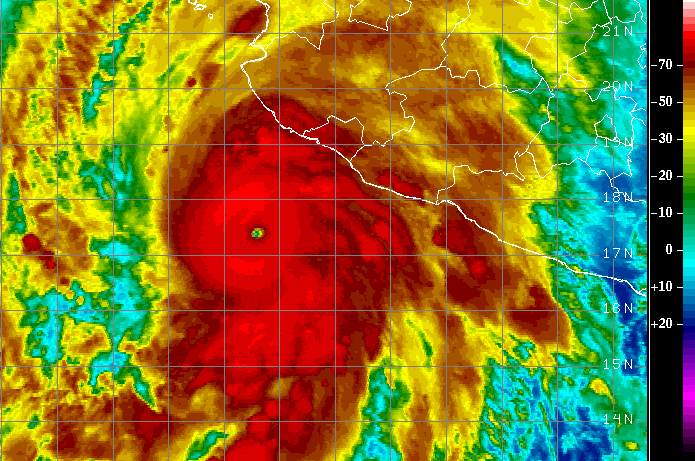 "Category 7" Hurricane Patricia threatens western Mexico. The hurricane is generating astonishing sustained winds of 200 mph, according to the 10 a.m. advisory from the U.S. National Hurricane Center. The Saffir-Simpson hurricane wind scale rates hurricanes on a scale of 1-5, depending on the maximum sustained winds. The strongest hurricanes, categorized as Category 5 storms, produce maximum sustained winds exceeding 155 mph and inflict catastrophic wind damage. However, one limitation to this bounded scale is that hurricanes with winds of 160 mph and 200 mph are both classified as category 5 storms. Infrared satellite imagery depicts category-5 Hurricane Patricia approaching Western Mexico on Friday morning. If the Saffir-Simpson Hurricane Wind scale were a continuous scale, with no upper bound, Patricia might be classified as a Category 7 hurricane, when we consider Category 3 storms produce winds of 115-135 mph, and Category 4 hurricanes produce winds of 135-155 mph. Perhaps Category 5 hurricanes should be categorized 155-175 mph and Category 6 hurricanes 175-195 mph. Rare storms like Patricia and Super typhoon Haiyan, which impacted the Philippines in 2013, could be classified as Category 7 tropical cyclones with winds exceeding 195 mph. Some may argue that once winds reach 155 mph, there is no difference in wind destruction. From a wind engineering perspective this may be true. However, other hurricane hazards like storm surge are generally related to pre-landfall maximum sustained winds (although other factors — like hurricane size — are also important). Visible satellite imagery depicts Category 5 Hurricane Patricia approaching western Mexico on Friday. 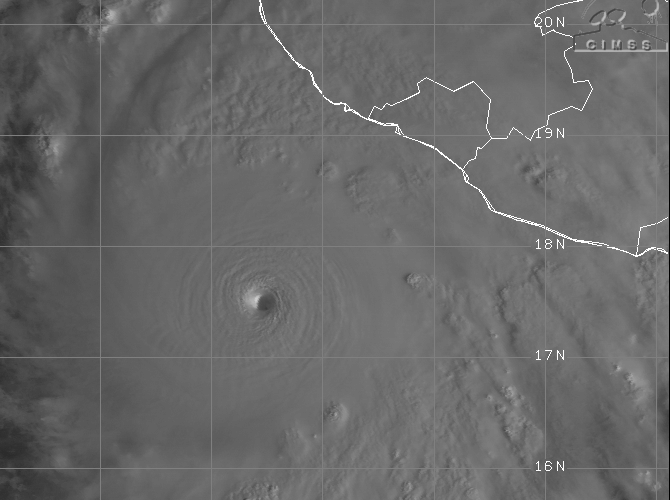 This 1-km resolution image shows Patricia's tightly-wrapped eye, which is common in the most intense hurricanes. I co-authored a paper with Dr. Barry Keim in 2014 that found a significant relationship between storm surge heights and pre-landfall winds, with hurricane winds 18 hours before landfall producing the best relationship with surge levels. We also found a non-linear relationship between storm surge heights and pre-landfall winds. According to this study, we found that doubling pre-landfall hurricane winds increases surge potential by a factor of 4.59. This means that the strongest hurricanes move much more seawater than "average" hurricanes. These principles should concern us when we consider Patricia's pre-landfall winds of 200 mph. From a storm surge perspective, the only approximate analog to Patricia in the literature is Hurricane Kenna, which produced pre-landfall winds of approximately 165-170 mph and generated a 16.5-foot storm surge at San Blas, Mexico. Kenna also generated 10-foot waves at Puerto Vallarta. 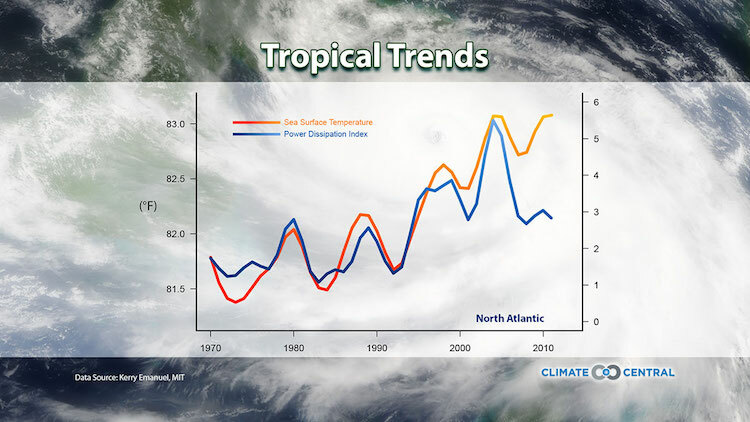 Storm surge heights relate better to pre-landfall winds than wind speeds at landfall. This graphic, taken from Needham and Keim (2014) shows that wind speeds 18 hours before landfall correlate best with surge heights. This is a concern as Hurricane Patricia approaches Mexico's West Coast with maximum sustained winds of 200 mph (325 kph). More recent research I led provides an overview of storm surge data sources, observations and impacts for western Mexico. Kenna's storm surge is the highest observed coastal flood event for this region, according to the SURGEDAT global storm surge database. Patricia is substantially stronger than Kenna and will make landfall farther south. The area to the west of Manzanillo will likely be most vulnerable to storm surge. Coastal interests in this region should brace for an exceptional wind event, with catastrophic storm surge flooding. I expect that Patricia's surge heights will likely exceed 16.5 feet, and will be accompanied by large, destructive waves. This would be the largest storm surge in the modern history of western Mexico. Moisture from Patricia will stream into the southern U.S. and exacerbate the heavy rainfall event that has already started in Texas. I am in Galveston, Texas, today, where the coastal population is bracing for substantial flooding from the combination of high "tides" (surge) and heavy rainfall over the next several days.